Whether it is time to leave the park, time to go to bed, or because a favorite toy was taken, inevitably all of our children throw a few good tantrums in their toddler years. As a parent, this can be incredibly frustrating and can easily escalate into a shouting match or display of dominance where everyone leaves with their feelings hurt and nothing real is accomplished. 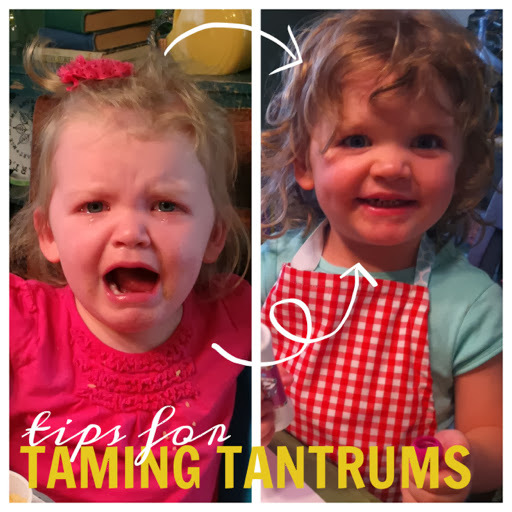 I would like to give you a few tips on how to tame a tantrum. Please know that I write this as a parent that has been there - today even! I am not perfect, but sometimes we all need a little reminder or a new idea. Understandably, life is busy. Imagine how stressed you feel when you are running late to work, your daughter won't put her shoes on and your other daughter is sitting on the floor crying because you can't pick her up. Our children sense our stress. Make sure that you have enough time to allow little ones to contribute by putting on their shoes, walk down the stairs by themselves and jump into the car seat. Simply slowing down can stop tantrums before they even start. Make sure there are clear, easy to follow rules that are consistently communicated. When small children (any children really) know what to expect, they are more well equipped to handle the situation. Be present with your kiddos. When you get down on the floor with them, play, listen to their stories, sing songs and giggle, there is a stronger bond between you and your child for when those tough times do come. I know that load of laundry needs to be started. Trust me, mama, I understand. But when you come in the house from a day at school, take a moment to play and get them started with an activity. Then it is easier to slip away to start a load of laundry or put something in the oven. When the inevitable tantrum does ensue, yelling across the house will not solve anything. Get down on their level, look them in the eyes and speak to them clearly and in a soft voice. You might even try whispering so they have to quiet their cries to hear you. Even as adults, sometimes we just need to separate ourselves from a situation in order to calm down. When my daughter is crying for what seems to me to be no reason, she knows that she has a chair where she can sit, or she can go sit on her bed and "take a breath." It is not necessarily a time out (we do not call it that) because she is not being punished. She knows once she calms down, she is free to get up and play again. It is just a separation from the event that caused the meltdown. Did a tantrum begin because of a particular event (ie: a toy being taken)? A good way to approach this issue is to simply redirect to another activity. I have seen tears stop in an instant by just suggesting a different toy or giving the opportunity to color instead. When tempers are short in our house, one of our tricks is to go outside. It is amazing what a little fresh air can do for your perspective. Do not focus solely on the negative. Find things that your children are doing right and give them a high five for those awesome things! "I saw that you shared with your sister. That is so awesome!" Or "Wow, you are such a big kid when you take your plate to the sink all by yourself!" Children will beam with pride hearing your words. Give them positive things to live up to. When it seems that my girls are having melt down after melt down and nothing specific seems to be triggering them, I love the option of turning to my shelf of essential oils. A drop of Young Living Peace and Calming on the back of the neck, or a drop of Joy over the heart, or a drop of Frankincense over the liver.... Calm, promote a sense of togetherness and joy. I have seen some pretty rough days turn into peaceful nights by using essential oils. Always remember, as hard as it is sometimes to believe this, that this too shall pass. The days go by, bedtime comes for a little breather, and soon, this stage will be over.